Do You Need Plant Insurance? Do you need plant insurance? If you weren't born with a green thumb, you might think so. Gardening is a lot of trial and error, learning from mistakes and can be more art than science! 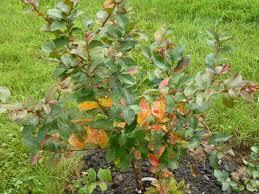 However, there is a way to increase your chance of success with your newly planted trees and shrubs. The answer is root stimulator, one of our top selling products. 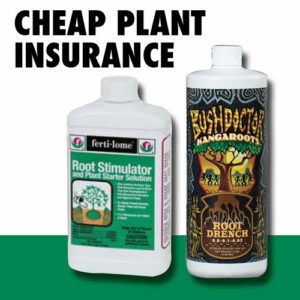 We like to call it "cheap plant insurance". It can be used on just about anything that's going from a container to the ground. 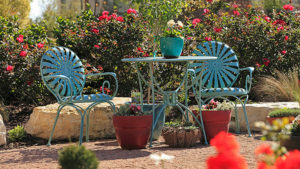 We especially love it for trees, shrubs and perennials. Root stimulator is formulated to enhance early root growth and strong root development. This is important because when a plant is first placed in the ground, the first thing it wants to do is set roots. Root stimulator encourages this process to occur faster, leading to more vigorous plant growth. Root stimulator comes in a liquid concentrate. Mix with water according to the instructions and pour around the base of the plant. You can use root stimulator about twice a month for the first two to three months after planting. If your plant is doing alright after that, high five! If it starts to struggle, you can try using another round of applications. Root stimulator not only increases root production, it can also help relieve some of the stress from planting (for the plant, not for you, silly). This is known as "transplant shock". Sometimes when plants are moved from container to the ground disturbance of the roots or just a different soil environment can cause plants to "stress out". Yup, this can happen even if you did everything right. Transplant stress can be seen within a few weeks after planting and is characterized by yellowing or browning leaves that fall off easily. Don't get discouraged if your plant does this! If your plant loses its leaves, it's still alive and is trying to conserve energy. Keep up your normal watering routine and use your buddy Mr. Root Stimulator. Many times, the plant will recover. Sometimes not. Remember, even the best gardeners still lose plants on occasion. But, those that use root stimulator lose them less often! Come by The Garden Center any time and we can show you which one to get. Happy Planting!